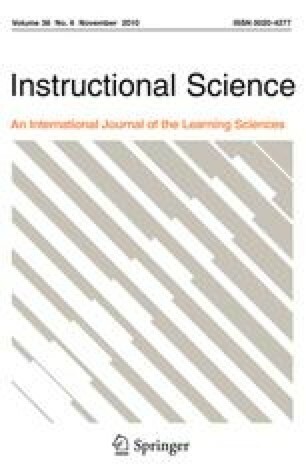 This paper reports on a quasi-experimental study comparing a “productive failure” instructional design (Kapur in Cognition and Instruction 26(3):379–424, 2008) with a traditional “lecture and practice” instructional design for a 2-week curricular unit on rate and speed. Seventy-five, 7th-grade mathematics students from a mainstream secondary school in Singapore participated in the study. Students experienced either a traditional lecture and practice teaching cycle or a productive failure cycle, where they solved complex problems in small groups without the provision of any support or scaffolds up until a consolidation lecture by their teacher during the last lesson for the unit. Findings suggest that students from the productive failure condition produced a diversity of linked problem representations and methods for solving the problems but were ultimately unsuccessful in their efforts, be it in groups or individually. Expectedly, they reported low confidence in their solutions. Despite seemingly failing in their collective and individual problem-solving efforts, students from the productive failure condition significantly outperformed their counterparts from the lecture and practice condition on both well-structured and higher-order application problems on the post-tests. After the post-test, they also demonstrated significantly better performance in using structured-response scaffolds to solve problems on relative speed—a higher-level concept not even covered during instruction. Findings and implications of productive failure for instructional design and future research are discussed. The research reported in this paper was funded by a grant from the Learning Sciences Lab of the National Institute of Education of Singapore. I would like to thank the students, teachers, the head of the department of mathematics, and the principal of the participating school for their support for this project. I am also grateful to Professors David Hung, Katerine Bielaczyc, Katherine Anderson, Liam Rourke, Michael Jacobson, and anonymous reviewers for their insightful comments and suggestions on earlier versions of this manuscript. Parts of this manuscript have also been presented at the 2008 meeting of the Cognitive Science Society. It was a bright, sunny morning and the day of the Singapore Idol auditions. Hady and Jasmine were going to audition as a team. They were practicing at their friend Ken’s house and were planning to bike to the auditions at Singapore Expo. The auditions were supposed to start at 2 p.m. and Hady and Jasmine wanted to make sure that they could make it in time. Hady: Ken, how do we get to the Singapore Expo from here? Ken: Well, follow this road (pointing to a map) until you reach the expressway. I usually drive at a uniform speed of 90 km/h on the expressway for about 3 min. After that there is a sign telling you how to get to Singapore Expo. Jasmine: How long does it take you to reach Singapore Expo? Ken: It normally takes me 7 min to drive from my house when I am traveling at an average speed of 75 km/h. After getting the directions, Hady and Jasmine left Ken’s house and biked together at Jasmine’s average speed of 0.15 km/min. After biking for 25 min, Jasmine biked over a piece of glass and her tire went flat. Jasmine: Oops! My tire is flat! What shall we do now? Can I just ride with you on your bike or shall we take a bus the rest of the way? Hady: I don’t think that is a good idea. My bike is old and rusty and it cannot hold both of us. Taking the bus is not a very good idea either. There is no direct bus from here to Singapore Expo, so we would have to take one bus and then transfer to another one. All the waiting for buses would definitely make us late. Do you have any money on you? Jasmine: Let me check….. I forgot to withdraw money today. I only have $2. Hady: I did not bring my wallet. I only have $1 for a drink. Jasmine: Since we do not have enough money to take a taxi, shall we just leave our bikes here and walk? Hady: It takes me approximately 5 min to walk to school which is about 250 m from my home. How long does it take you to walk to school? Jasmine: It takes me approximately 15 min to walk to school which is about 450 m from my home. Hady: No, no, no! Walking would take too much time. We will end up late. Why don’t you lock up your bike and take my bike and bike ahead. Leave my bike somewhere along the route and begin walking to the audition. I will walk from here until I get to my bike and ride it the rest of the way since I can bike at a faster speed. My average biking speed is 0.2 km/min. Jasmine: That sounds like a good idea! But how far should I ride your bike before leaving it for you and walking the rest of the way. Since we are auditioning together as a team, we have to reach there at the same time!? How far should Jasmine ride Hady’s bike so they both arrive at the audition at the same time? The flight distance between Singapore and Sydney is about 6,316 km. A plane takes 7 h 20 min to fly from Singapore to Sydney. Find the average speed of the plane from Singapore to Sydney. Give your answer correct to the nearest km/h. Sydney’s time is 3 h ahead of Singapore’s time. If the plane departs from Singapore at 0955 hours, find its time of arrival in Sydney. The average speed of a ship for the first hour of a journey is 32 km/h. Its average speed for the next 2 h is 41 km/h. Find its average speed for the whole journey. Jack walks at an average speed of 4 km/h for 1 h. He then cycles 6 km at 12 km/h. Find his average speed for the whole journey.